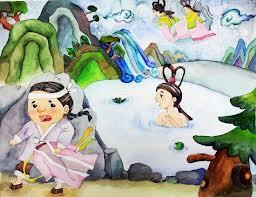 Angel and Woodcutter (sometimes called The Fairy & The Woodcutter) or 선녀와 나무꾼 is a traditional Korean story or fairy tale. The story focuses on one central character the Woodcutter (나무꾼), he is a honest, hardworking but lonely single man who longs for a wife and a family. To summarize the story, one day the woodcutter is in the forest working when a deer asks for his help avoiding a hunter. After helping the deer, the deer tells him about an Angel who comes down from heaven once a month to bath in a nearby pond. Also if the Woodcutter takes her clothes she will be unable to return to heaven. The Woodcutter follows the Deers advice and takes the angels clothes and then after meeting her, they fall in loves and love happily ever after. Of course this is just an overview and other things happen in the story.